Amsterdam, 20 January 2015 – Dutch fashion designer Hans Ubbink will design clothing and accessories made from sustainable Mongolian leather. “During a research trip in Mongolia I saw an excess of hides from horses, sheep and cows that have grazed freely for years on the Mongolian highlands,” Ubbink expressed during MVO Nederland’s New Year Event. Currently, merely a quarter of the Mongolian hides available is processed into leather. Those hides that are processed are often tanned by means of outdated tanning methods. Ubbink: “I want to help change this. Therefore, I accepted the invitation to work together with Mongolian herders, tanneries and workshops in order to create sustainably produced leather clothing and accessories. The products can be recognized by the new label ADUU MAL.” Jackets, bags, shoes and other accessories with the ADUU MAL label are available for purchase in the Netherlands next spring. On Saturday the 28th of March, Hans Ubbink will present the first exclusive pieces with the ADUU MAL label in Amsterdam. Next spring these pieces will be available in limited edition in the Netherlands. The line will be expanded in the fall, when jackets, bags, sneakers and other accessories will be made more widely available. Ubbink will design products with the ADUU MAL label for various brands. The names of these brands will be released at a later date. ADUU MAL signals Dutch consumers that leather shoes, bags or jackets from Mongolia are produced in the most sustainable manner. The hides that are processed into leather products originate from herds of horses (aduu), sheep, goats, yaks, and cows (mal). 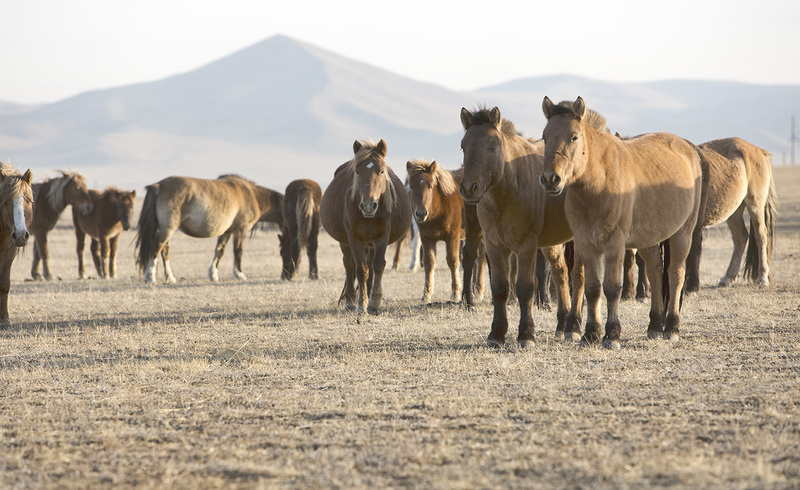 These herds – aduu mal in Mongolian – graze freely in the Mongolian highlands following century old traditions. The production process of products with the ADUU MAL label is as sustainable as possible. Firstly, the chemical company Stahl has educated Mongolian tanneries on the production of chrome-free leather and on the processing of those specific horse hides that would not have been tanned otherwise. Secondly, any wastewater is purified and reused. Finally, tanners, tailors and shoemakers are assured of healthy working conditions and earn fair wages. During his trip to Mongolia, Ubbink witnessed how the Mongolian nomads roam the vast highlands with their sheep, cows, and horses. “It is a beautiful sight to see the herds graze in freedom.” Mongolian herders utilize virtually every component of the animal to serve them in their daily lives, such as the milk, meat, intestines and even the bones. Due to the newest tanning methods the excess of hides that would previously have been wasted can now be processed into leather for the international market. ADUU MAL originates from a project initiated by the Dutch company MiM – Genuine Mongolia in cooperation with chemical company Stahl from Waalwijk and with support from MVO Nederland and PSI Foreign Affairs.